The C & G Tuners are 2 Tuning Forks. They are based on the Pythagorean Scale, also known as the Just Scale. They are also known as Whole Body Tuners. 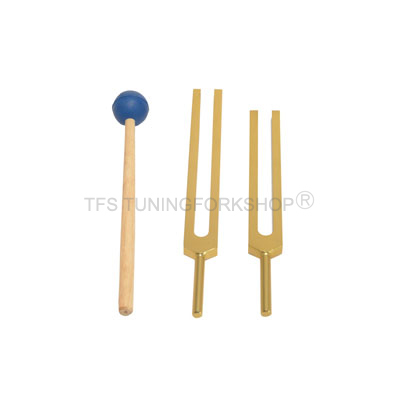 The C & G Tuners are a wonderful way to begin your exploration of tuning forks. The C & G Tunersare 2 Tuning Forks. They are based on the Pythagorean or Just Scale, also known as Whole Body Tuners. They create the special interval in music and sound therapies called the Perfect Fifth. In India, this Fifth is believed to create a sound through which Shiva calls Shakti to the Dance of Life. In Polarity Therapy, this star is the physical body in motion and the motion of subtle energy inside the physical body. It is also believed that this is the sound that, the Greek Sun God of Music and Healing, namely Apollo, plucked on his sacred lyre. He did this in order to beckon dolphin messengers to Delphi. Lao Tzu referred to this interval as the sound of Universal Harmony, balancing the forces of Yin & Yang.